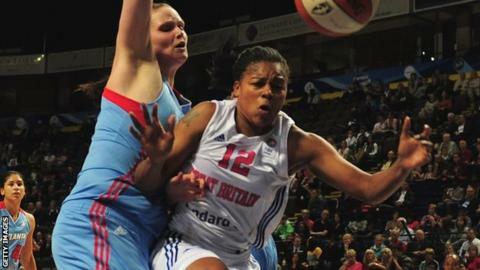 Steph Gandy has spoken of how she has returned to the Great Britain women's basketball team after almost dying on a surgeon's table last year. Detroit-born Gandy, who plays at club level for Sheffield Hatters, had an operation to remove fibroids - lumps of muscle and tissue - from her bladder. But complications during the surgery in July lead to her "bleeding out" and she almost lost her life. "It was a nightmare," said the 33-year-old forward, who has 42 GB caps. The keyhole surgery turned into a six-hour open operation. "The doctor said they can grow to any size but to have that many was rare. What he took out was similar to me being six months pregnant," said Gandy. "I was shocked. I'm a basketball player and I've been in sport my whole life. I went from being on the go constantly to being restricted to staying in bed." Fibroids are non-cancerous tumours that grow in or around the uterus. The growths are made up of muscle and fibrous tissue and vary in size. Fibroids can be symptomless, although some women will experience heavy periods and pain, and they can cause fertility problems and blood loss. She described herself as "skinny and weak" after the trauma of the operation and feared she may never get back into the game. "When I first got back on court, I was worried about people touching me and I was scared to play basketball. But the doctor told me I can't really sustain damage unless I take a massive hit." Gandy returned to the court in October to play for the Hatters, where she is in her second spell. And despite playing with internal stitches still in place, she went on to record her best ever season at club level, becoming the first person to win the MVP title in the inaugural WBBL campaign, as her side claimed the trophy, league and play-off treble. Gandy will now turn her attentions to the Eurobasket 2015 tournament in Hungary, where GB will play four group games against Russia, Latvia, Serbia and Croatia, with the winners of the tournament certain of a place at the 2016 Olympics in Rio. "It shows hard work pays off," she added. "Things happen in life and it gave me a whole broader look. "After the operation, it made me focus on basketball and do my absolute best."